Open Adobe Illustrator and create a new document (File > New). Artboard sizes and color mode of the new document depends only on your preferences. Take the Rectangle Tool (M) and create a rectangle of the size larger than the size of artboard. Stroke colors of the rectangle do not matter at all, but you'll need to set the fill to 0 in order to see a preview of the mirrored image. Turn on the Rulers (Command / Ctrl + R) and create horizontal and vertical guides by dragging them from the corresponding rulers. The guides must pass through the center of the created rectangle. It is not necessary to create the guides since they just show the position of the axes of symmetry. We basically have them set up for our own convenience. Create a random object on the artboard. I created an arrow to indicate the direction of the path. Select the entire layer in the Layers panel. Now go to Effect > Distort & Transform > Transform... and in the dialog box, specify the axis of symmetry and the number of copies equal to 1. For visual control over the situation, check the Preview option and press OK. Your template is complete, so you can start drawing. 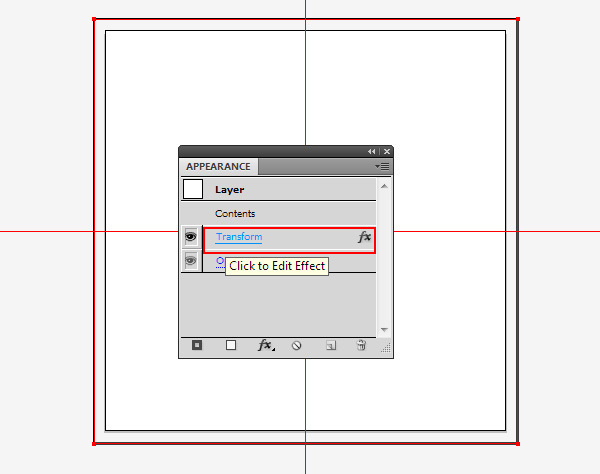 Turn off the visibility of the created object (in my case it's an arrow) in the Layers panel. Now select any of the drawing tools, for example the Paint Brush Tool (B), and create a path. As you can see, we've got immediate symmetry relative to the horizontal axis. At the same time you can draw on both sides of the axis of symmetry. Unfortunately, this method has two drawbacks which of course I have to warn you about. When crossing the axis of symmetry, the connection of the created path with its mirror copy is absent. The path exists on both sides of the axis of symmetry. This must be taken into consideration and try not to cross the axis of symmetry, unless you plan it, of course. Also you can't draw beyond the boundaries of the rectangle created in the first step, as this will ruin the symmetry of the entire system. That is why we have created a rectangle that is bigger than the artboard. You can always reset the configurations of the template. To do so, select the layer with the template and click on the Transform effect in the Appearance panel (Window > Appearance). This will open the dialog with the parameters of the effect. For example, you can change the axis of symmetry. You can even set multiple axes of symmetry, by choosing at the same time the options Reflect X, Reflect Y and setting the number of copies required and the rotation angle. But in this case, in addition to the symmetry, we also get a rotation relative to the point of intersection of the axes. Now let's draw something. 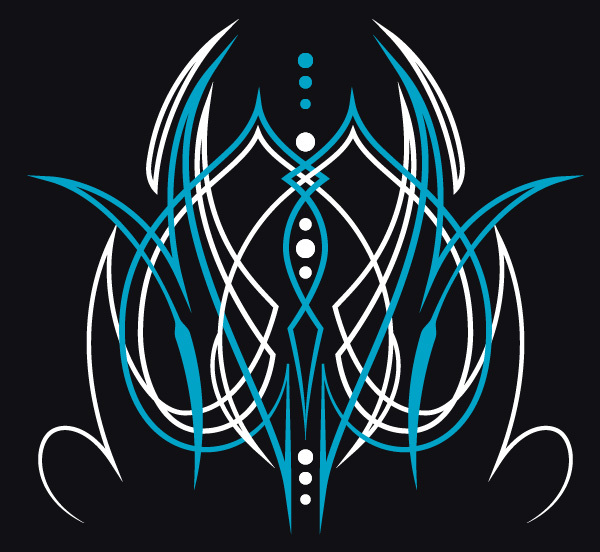 I created an abstract design in the style of freehand pinstriping. When the drawing is complete, select the whole layer, then go to Object > Expand Appearance. Mirror reflection materialized into regular vector objects. Auxiliary elements such as arrows and rectangles can now be deleted. Today, I told you how to make a mirror drawing using standard features of Adobe Illustrator. This method seems slightly inconvenient with some limitations. Note that this is not the only way to make a mirror drawing. Recently there appeared a new MirrorMe plug-in for instantaneous symmetry in Adobe Illustrator, which is much more convenient to use, and it also has more features as well.